This is an ultrasound scan of a premature infant brain. There is damage that looks like holes, on the right side of his brain. Looking at this brain scan, it is reasonable to think that he will have significant problems controlling the left side of his body. The majority of high-risk infants treated in a modern NICU have some form of brain scan, either an ultrasound scan done at the bedside +/- a CT or MRI in the radiology department. Ultrasound scans for neonates have been available since the late 1970s when I published the first clinical study of neonatal scans in Lancet. If you had a baby with an abnormality on an early brain scan, when were you told about it? I would really like to know how this abnormal brain scan was described to you. What were you told that it meant and by whom? In common practice, if a child has a head injury from falling off a bicycle or from a car accident, significant injury is always confirmed by a brain scan. In my experience in the pediatric ICU, the brain scan is discussed with the family and they are given as much info as the doctors have about the extent of damage. As the children improve, they are automatically discharged to an ongoing rehabilitation program. The focus of the entire healthcare team is to maximize recovery and return to function. What happens with the newborn who has suffered brain damage? Again, in my experience, parents on discharge from the NICU rarely have a specific therapy plan in place for their at-risk child. At the time of discharge home, were you given any specific instruction to help your baby recover from the documented brain damage? When did you first start to think that there might be problems with your child’s development? When and by whom was the diagnosis of CP made? After the diagnosis was made, at what age did your child start specific cerebral palsy therapy with a physical therapist (PT)? My son was born at 33 wks. He had brain scans, but we did not get told of any injury to the brain. He spent 54 days in the NICU coming home the day before his due date. Fast forward a year, he’s not walking yet, asked te doctor about it and get the ‘oh he’s a preemie, give him time’ response. Now he’s 18 months old, took his first steps but doesn’t walk well until 20-22 months. Notice he walks in his toes an his left foot turns in. Ask the doctor about it, he sends us to a orthopedic surgeon for routine foot care. We are told that he just needs to stretch because his tendon is tight. Nothing else required. Left foot still turns in. Now he’s 3, doesn’t jump, doesn’t balance on 1 foot, has trouble with stairs, doesn’t pedal a trike. Get the same preemie response for all my concerns. He sees a doctor that isn’t his normal pediatrician, for a cough. She watches him walk and gives us a referral for a PT evaluation, says he might need therapy to catch up by kindergarten to other kids his age. Have his evaluation, he’s 3 1/2 at this point, FINALLY get the CP diagnosis that explains so muh about our little boy. Start PT immediately. It’s been 7 months since his diagnosis and therapy began and now he can walk better, jump and even pedal a trike. Still working on the balance part. He also just finished serial casting on his legs/feet which was a tremendous help!! He wears daytime orthotics and night orthotics to keep his progress from the casting. We now have a wonderful outlook for him! It took too long for us to finally get a diagnosis. I hope that I can somehow help the next families get diagnosed much quicker. When Emma was born (1996) she was huge, but seemingly healthy baby, 9 lbs 4 ozs, but the pregnancy was overall good and healthy with with no gestational diabetes. I was instructed not to push as the doctor was running late, so I don’t know if there was loss of oxygen at that point. Other possible contributors to Emma’s CP: I had undiagnosed hypothyroidism at that point, I had a bout of bronchitis during pregnancy, I was exposed to a chemical spill at work, my husband is a Persian Gulf War vet, Emma experienced a bout of RSV with nebulizer treatments from age 3 mos to age 5 mos. I started to notice delayed walking or trying to walk but falling and weaving a lot. Though looking back, she had trouble rolling and would scream if her legs where pulled too suddenly into what would be a normal diaper changing position. At 16 months I started to wonder what the issue could be. And even then we would question if we were bein silly because Emma could climb anything! We fist saw a specialist when Emma was almost 3 years old. Our insurance didn’t approve a specialist until she had seen an orthopedic doctor twice who decided after x-rays that he couldn’t see anything abnormal. Emma was diagnosed by a neurologist at Children’s Hospital in Denver within the first 10 minutes of the appointment. He immediately referred us to an orthopedic doctor and from there we were given the go ahead to start PT and get AFO’s. So she started all treatment at 3, yet a brain scan was never ever offered and I didn’t know to ask for one. I think at age 7 she had one at St Louis Children’s hospital when she had a selective dorsal rhizotomy, but it was not explained or reviewed. Owen was born and had seizures about 12 hours after. We were told he had an abnormal EEG and MRI and left the NICU 12 days later with a diagnosis of HIE. We were told he could have issues or he could be fine. Our pediatrician noticed at 6 months that he wasn’t bearing weight on his legs and got us into physical therapy. The therapist noticed a right hand dominance and got us into occupational therapy. Soon after, we had a follow up EEG with a normal result and weaned off phenobarbital. My son was 18 months old when we got the official diagnosis — mild hemiparesis. He had been in therapy long before the diagnosis at my pediatrician’s insistence. My son is 19 months old and is still not walking, but after constraint induced therapy in the spring, has since learned to crawl, cruise, and climb up onto the furniture. I wish I had been told about my state’s Early intervention program when we were discharged from the NICU…. I’ve just now gotten my son involved. My baby was delivered the day she reached 26 weeks gestation due to severe pre eclampsia and reversed end diastolic flow in the umbilical cord. She had a grade 1 IVH and no further problems. No one ever talked to us about CP. 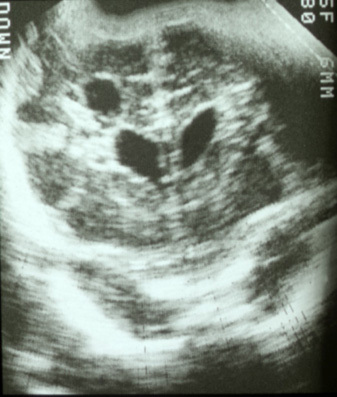 The ultrasounds did not reveal PVL. After three months, she was discharged from the NICU. I’m still bitter about being sent home only prepared for the best case scenario (catching up easily by two). I knew there was some sort of motor issue after she had been home for three months (six months actual). She started early intervention immediately. She was diagnosed with CP at 18 months. The developmental pediatrician suspects that it is due to PVL. However, she hasn’t had an MRI to confirm the PVL. It involves sedation so the risks outweigh the benefits for now. Currently, she turned two last month and walks with minimal orthotics. Her gross motor is improving. She struggles with fine motor skills and feeding. My daughter Rachel is 16 now. She was not premature but she had shoulder distocia and was stuck in the birth canal for a few minutes. So after resuscitation she was taken to the NICU. She had an ultrasound and a brain ct. Both showed small bleeds and infarcts. I’m an X-ray tech but I didn’t make the connection. She immediately started a birth to three program where she received therapy for her brachial plexus injury she sustained during birth, but no one told me it was CP until she was 2 when we saw a neurologist. She really wasn’t behind all that much. The initial therapy was for a brachial plexus, and the therapist would say her other arm and leg were tight and they would include those areas in her therapy. She does well now. She walks with an abnormal gait. The most difficult problem has been the brachial plexus. But it did force her to use her right arm which was affected by the CP. My son had a hypoxia event at 2 months 26 days old. He was a full term infant but suffered an episode of SVT that ended in cardiac arrest. When we were discharged from the hospital we were given outpatient PT and OT one hour each twice a week. The co-treated so he really only got 2 hours total per week. He hasn’t been given the CP diagnosis that I’m aware of, but all of the therapies we are currently doing are geared toward his motor delays and vision impairment which are all textbook CP issues. He is 16 months old now and in a home health program that involves 3-40 min. Pt, 2-40 min OT, 2-40 min.speech/feeding, and 2-30 min Vi. We also treat with ahome hyperbaric chamber and intend to seek Stem Cell therapy. In essence I didn’t wait around to see what he would get, I fought to give him anything he could get. It’s a shame we have to fight so hard. — we were told about the abnormalities after the MRI results were received. — I felt like our scan could have been described a lot better. The neonatologist described it to us when we were in the hospital. His words were “it is concerning. You see here there should more of the squiggly lines and there is not.” I felt like he dumbed it down too much. He said it was a a wait and see game. He did say that a baby’s brain does have ways of re-wiring itself. –we had a physical therapist come and talk to me about some physical therapy exercise/play to do with my son. My son, Gabriel, was born at 25 weeks by c-section due to complications of pulmonary edema during the pregnancy. At birth they discovered that he had a Grade 4 on the right and a 2 on the left side of his brain, along with ROP and PDA! It was at that time, my husband and I took action to learn everything we could about Cerebral Palsy and steps we could take to do everything we could to ensure him as close to a normal life as possible! At 5 months old we started PT and OT and incorporated what we learn in his therapy sessions to his everyday life! Everything Gabriel does on a daily basis has some sort of therapy in it! He is now 3 1/2 years old and he helps with laundry, housework and even cooking meals! He started school at Capstone Academy (UCP ran school) when he turn 2 1/2 years old! He has been receiving Botox injections to his left side for the past year to help his range of motion! He runs, jumps, dances like a normal child! He is able to bathe, dress and undress himself! We are still working on potty training though! He can hold a complete conversation with you even though his speech was delayed! He knows all of his alphabet (capital and lower-case), numbers 1-20, including writing them, his colors and shapes! He has truly excelled academically! I hope this helps! My experience is that children with disabilities wNt to learn and do things themselves! My husband and I are raising Gabriel to be independent and self-sufficient! I see so many parents of children with disabilities that are so afraid of the disease, that they want to do everything for the child and prevent the child to do for themselves! I believe a child with a disability has so much potential to more than what they can if they have some sort of independence to try on their on! I am an adult with mild CP. I was born in 1971, but I did not know that I had CP until I was 21 when I had a medication induced seizure. Unfortunately, this is also when my mom was told. When I was a child my mom was never made aware of the fact that I had CP. And it was interesting that I have copies of some of the notes from the neurologist that I saw when I was about 9 or 10 years old because the school needed it for an IEP. And when I saw those notes I saw that the neurologist stated that I did indeed have CP, but as I said she was never told that I had CP. There were numerous opportunities for the doctors to have told her about my CP even though it was mild but they never did. When I started having issues with my right foot (didn’t realize this at first until my body used my fibromyalgia to let me know that something was going on with my feet) in 2008 to do the Achilles tendon lengthening (the second time in my life, the first time I had the surgery was back in Sept of 1978 when I was 7 years old and it was effective until I was about 19 or 20 years old) then I became more aware of what my CP was doing. And when I told the Podiatrist about the fact that doctors did not tell my mother when I was a child that I had CP he was not happy. Same with the doctor who is now my Primary Care Physician (he’s a D.O.) when I met him for the first time and he was trying to clear me for the surgery I needed to have on my left foot back in 2011. Because of the way that the CP has affected my feet my Podiatrist has had to do more work to fix those issues including one with the 5th digit on my left foot. It’s been 6 months since that surgery and I am doing much better but I am one that it takes a while to recover from surgery. If you were to meet me in person you would be like “are you sure you have CP” if you were one that was not familiar with what CP can do because of the stereotypes that people have about those that have CP. Ultrasound technology was not made available to diagnose my CP at birth and when they put me in the intensive care unit (not even sure if NICU was known back then the way it is now) or I am sure they would have told my mom, and she would have remembered. Because of how mild my CP is not only have my doctors pushed me to try and do more but I went to school not only for computer operations and then later Medical Secretary (now medical administrative assistants), but I also went to school to become a Medical Assistant and then recently was going to school to become an RN. However, due to some issues with the school I was going to I have not been able to continue although I am working on trying to find another school to go to so that I can complete that degree as I feel it is a field that gives me the best chance to get a job. I have one more year of school left. And I really loved Nursing School. Kelley was born at 26 weeks and was in the NICU 96 days before leaving hospital on nasal oxygen. During her time we were told that she was having ultrasounds and scans on her brain but when asked the nurses would say everything is fine. Much to our suprise when discharged the Dr told us she had perevintricular luekomalsia and that it had dissolved into her right ventricle and that we would have to “watch” for cerebral palsy. I was in complete shock tjis was in 1995 so computers and internet had not reached the height of popularity like now. We lived on a Air Force Base with a wonderful peditrician that was knowledgeable about preemies who told us about early intervention we started therapy immediately. We knew she wasn’t caught up by 12 months and continued with early intervention when we moved due to the military. I researched cerebral palsy extensively and knew that was what her diagnosis would be finally when she turned 2 we got the diagnosis by a pediatric neurologist. Kelley has been affected physicallt her speech and cognition is well advanced she just graduated high school with 4 years honors and being in gifted program she is attending college in August to become an Early Childhood Educator. She uses crutches to walk and a wheelchair for long distances she is absolutely an amazing soul! My son was “diagnosed” at 30 weeks s/p emergency csection at 28 weeks- I had severe preeclampsia. He has a grade 4 IVH on the left side. He is in OT, PT, he has a home nurse every other month, a neurosurgeon, a neurologist and I also take him “swimming”. He is 9 months from birth, not gestation. He is not able to crawl yet, but hecan sit supported, he laughs, babbles and screams. And he is very aware of his surroundings. My son was injured at birth and had HIE. They weren’t sure what the results would be. He started seeing physical therapists thru Early Intervention when he was about 9 months old because of developmental delays. They told me he had CP when he was a year old. The doctor who told me apologized and said that someone should have told me sooner. I think everyone was avoiding handing down the life sentence. Dr. Pape – Our twin 25 week preemies (now 3 1/2) each had ultrasound scans everyday or every other day for the first week or so after birth because they both had grade III and IV IVH. Then the scans were weekly. We were constantly monitoring to see if it would develop into hydrocephalus and then require a shunt for them. And the doctors explained in detail all of the possible issues that could occur as a result. The son (baby boy B) with “only” grade III and IV (instead of IV on both sides) ended up needing a shunt at 38 weeks and has had 5 revisions. He immediately started OT after discharge from the hospital, then eventually PT and speech. I constantly (from day one) thought their would be something wrong with their development so I don’t think there was a day when my worry-meter went higher. But for Baby B he was not diagnosed with CP until he was almost 2 and he started walking at 2 1/2. Once he was diagnosed, his therapy regimen did not change drastically because he was already getting therapy. For Baby Boy A, he did not require a shunt, but due to other complications after birth, his growth was slower and he has complex vision issues. What the doctors explained to us with him was that there was a 60-80 percent chance he would be mentally and physically disabled and that his quality of life would not be good. He also started OT right away upon discharge, then a vision therapist was added (who he still sees weekly), PT, Speech and orientation and mobility. We knew A’s development was far behind his brother’s and he was diagnosed with CP at 15 months old by the neonatal follow up clinic, but probably could have been earlier if I pushed it sooner. As I recall though, he was not due to see that clinic until March and I started to worry that we needed more for him in January and that’s when he was diagnosed. We added outpatient PT to his routine and since then he’s had combination of outpatient and early intervention therapy. Both boys have benefited from the free early intervention therapy teams from 0-3 and now 3-5 and we supplement that with outpatient OT/PT and just started horseback riding. Although I don’t describe it as a “therapy plan”, that would require even more logistics in keeping all of this straight. If a care coordinator of some kind was available that would really be helpful. What one of the most frustrating pieces of the last 3 and a half years has been is the Unknown. Yes, they think A will walk (as do I) but will he be able to see well enough to read and will his communication skills ever reach a level of his peers? I don’t know. But for the most part, I find comfort and joy in each of their accomplishments because neither of them should even be here to display such resilience. While my child spent time in the NICU, he did not get a brain scan before discharge. He was born at 34 weeks and no brain damage was suspected. We began to get concerned about his development when he was around 8-9 months; he has a twin brother who was able to sit up, crawl and reach other motor skills while he was still just rolling. Our pediatrician told us he was “just lazy” at the 9 month check up, but we had suspicions otherwise. After a few more follow-ups, we finally got a referral to a developmental ped when he was 12 months, along with a physical therapy assessment. We were put on a 10-month waiting list to see the dev ped, but when the physical therapist saw him, she was really concerned and got us in with the specialist sooner. He was 15 months when he finally got an MRI that indicated PVL, which explains a lot of his development delays (his legs are tight, his core is weak and he has immature reflexes). We switched pediatricians and were finally told it’s CP. Hope this is helpful. Thank you! Thank you. It is helpful. I am sad though that so many parents go through such a wait and a fight to get help. Please read the spasticity and alignment tags to get some ideas to try. Good information. Thank you for sharing this to us. Thank you so much. my son was born 3rd April 2012. Suffered hie and had to be resuscitated. sit up right and talk. We put it all down to therapy we have avoided all other interventions. Hi Karen, I just found this site after seeing you on The Agenda earlier this week speaking about your new book. Our story is very similar to the previous replies. My 4 year old son Oscar has diplegic spastic CP and we live in southern Ontario. Oscar and his identical twin were born at 33 weeks via c-section. Oscar was on a ventilator for 2 days at birth and had more difficult time breathing than his twin. Both were in NICU for 1.5 weeks, then transferred to peds for 2 more weeks. I asked and ASKED the hospital pediatrician about possible complications from the difficult birth, but was only told about the possibility of asthma and allergies. By 10 months, I was noticing Oscar’s unusual sitting position with his legs slightly bent in front of him. I asked our pediatrician (different one from the hospital) about this and was referred to an infant development program to have his progression monitored. I actually diagnosed Oscar’s CP by a Google search, and then brought it up to our pediatrician. This is quite possibly the worst way for a parent to learn their child has a disability. She still refused to diagnose him, and even worse, the child development staff at the infant development program assured us that Oscar did not have CP; which in hindsight should never have been said. Regardless, prior to any diagnosis (which we did eventually receive when he was over 2), I began to have him work with an excellent PT. Her advice at one of our early sessions was not to coddle Oscar, and make him work just as hard, and stay as active as any other child, regardless of disability. This advice, along with early PT intervention, has been invaluable to us, and something we keep in mind every day. Now that Oscar is in JK, our next task is to ‘train’ the school about his capabilities. In the two months he has been in school, the school staff insist on hand holding and promoting his use of an accessible bus (which we refuse). Advocating for your child’s independence at school is a little counter intuitive in today’s culture, but without it, we don’t want to see him regress. He is a smart, capable boy that we want to keep confident and independent! Sorry for the delay. This comment took awhile to reach me. Thank you for sharing your story and good for you for helping your child in such a positive way.I have two suggestions.Show this post to his teacher. http://www.karenpapemd.com/habit-hides-recovery-what-does-your-childs-teacher-need-to-know/ Then consider giving the important teachers and therapists that interact with your son and maybe even the paediatrician, a useful holiday present of my book.Knowledge can be transformative and most people do not know much about CP. Together we can change it! My boy also has cp due to traumatic birth. He is 6 months and refuses to put weight down on his hands. Can anyone relate or share experiences on how they helped their little one to put weight down on hands? Please is someone can share tips on exercises too. No pt referral made and I feel like time is ticking. I would ask for the PT referral and assessment. There is very little value in a “wait and see” approach. He should also see a neurologist to determine what type of injury he has. Hope this helps.